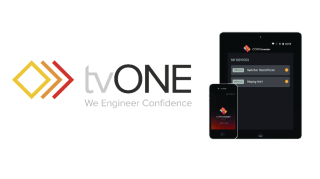 The What: tvONE has launched the CORIOmaster app, a control tool for CORIOmaster video wall processing systems. The CORIOmaster app is a free application for smartphones and tablets that extends the control of CORIOmaster video walls onto mobile platforms. With the new app, users now have access to the powerful video wall processing systems in the palm of their hands. The What Else: Users can execute all simple control functions with ease through the CORIOmaster app, including viewing all canvases, viewing “source-to-window” assignments, activating presets, switching inputs, and assigning fresh sources to windows. Additionally, more sophisticated control is possible by sending single or command chains using API commands set. The Bottom Line: The app provides a secure wireless control platform, allowing users to control CORIOmaster wirelessly on an internal Wi-Fi network. Additionally, the app gives users the ability to control CORIOmaster without having to launch the CORIOmaster design software, CORIOgrapher. The new application works with Apple (iOS version 9 and above) and Android (v5.0 [Lollipop] and above) devices.